Organic & tasty. 100% natural. As good as homemade. BPA free. Cold pressed. No added sugar. 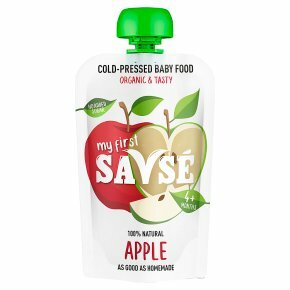 This delicious blend of organic apple is a tasty meal or snack for babies four months and up. Doctors recommend you don't need to wean your baby until they're six months, however every baby is made different! To warm stand in hot water and test temp before feeding. Never heat in the microwave. Be careful as the cap could be a choking hazard to little adventurers.